For those of us who teach and research the Holocaust and anti-Semitism, the Trump administration’s refusal to mention Jews in a statement commemorating International Holocaust Remembrance Day has been both horrifying and confusing. It has been horrifying because the failure to acknowledge that Jews were the overwhelming victims of Germany’s genocidal campaign is unquestionably a form of Holocaust denial. It has been confusing because we haven’t been able to understand why the administration would choose to engage in Holocaust denial nor begin to grasp the implications for the American Jewish community. There had been warning signs throughout the 2016 campaign. In three years of teaching a course on America and the Holocaust at Northeastern University in Boston, I have always treated American anti-Semitism as mostly a remnant of a darker time in American history that only manifested itself now on the extreme left or the extreme right of American politics. As I taught the course this fall, however, I had to confront Facebook memes depicting Trump critics in concentration camp uniforms behind Auschwitz’ gates and Stars of David superimposed on Hillary Clinton’s face in front of piles of money. I had to read the stories of Jewish journalists, who received a steady stream of vicious anti-Semitic messages delivered to their email inboxes, Twitter accounts, and even front steps. Still, I assumed that the problem was that Trump and his minions weren’t doing enough to rein in their more vociferous supporters. Even after Trump chose Steve Bannon, the executive chair of the far right and white supremacist affiliated site, Breitbart News, to run his campaign, I still assumed that Holocaust denial and the anti-Semitism inevitably associated with it, weren’t important to Trump. After all, he has a Jewish son-in-law, daughter and grandchildren. Then came the Holocaust statement that didn’t mention Jews. The White House press secretary attacked those who criticized the statement as “ridiculous,” “pathetic,” and “nitpicking,” and explained how much “the president went out of his way to recognize the Holocaust.” Politico recently reported that the State Department had drafted a statement mentioning Jewish victims, similar to ones issued by Presidents Bush and Obama, but that the Trump White House refused to use it. The administration also seemed to defend that statement by releasing the nugget that it had been written by a Jewish advisor. In the days following the offensive statement, those who study the Holocaust responded quickly and fiercely. Led by the United States Holocaust Memorial Museum, they asserted the undeniable historical record of Jewish targeting and Jewish suffering, and condemned those who tried to obfuscate it. Indeed, Holocaust scholars have done a good job tackling what was horrifying in what Trump said. But we haven’t faced what was confusing. Why would the President of the United States in a public statement on a most solemn of days choose to identify with Holocaust denial and anti-Semitism? What was he, and frankly Bannon, trying to say and to whom? Were they speaking to the white supremacists and anti-Semites among Trump’s followers who clearly got the message? Was it just another example of this administration’s intent to defy all societal norms, even seemingly the most sensitive and nearly universal ones surrounding Holocaust remembrance? Did they relish the fact that they could get away with it? Was it a sinister threat aimed at liberal Jews who retain powerful positions, particularly in the media and entertainment industry? Did it reflect the administration’s adoption of the Russian perspective on this as on so many things, leading it to parrot the old Soviet-line that many people were “innocent victims” of the Nazis? Was it a signal to everyone in society that nothing, not even the murder of six million people, is sacred? I don’t know the answer or answers. But those of us who research and teach this most important and most profound of topics should not just condemn the deeply demoralizing statement but also begin to probe its meaning and ramifications. That means we need to do what makes us profoundly uncomfortable — establish clearly and publicly the connections between the history we understand and the reality we are experiencing. Of course, we must do it with the scholar’s mindset, pointing out the differences as well as the similarities, rejecting overstatement and emotionalism. We also need to encourage the journalism that seeks to reveal the administration’s motivation and operation and then be willing to analyze the disclosures through our unique lens. We need to jump into the public arena in a way we never have before. Right now that may be the most important work as scholars, as Jews, as citizens, that we can possibly do. The omission drew ire from American Jewish groups. The Trump administration defended its decision to omit any mention of Jews or antisemitism from its statement marking International Holocaust Remembrance Day, noting that Jews were not the only victims of Nazi slaughter. “Despite what the media reports, we are an incredibly inclusive group and we took into account all of those who suffered,” Hope Hicks, a communications aide for the president, said in a comment to CNN. 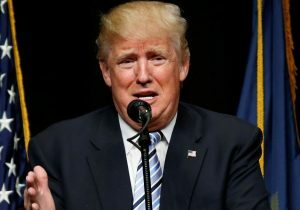 In his statement, Donald Trump vowed to stand up against the forces of evil as president. “It is with a heavy heart and somber mind that we remember and honor the victims, survivors, heroes of the Holocaust,” the US president said in the statement. Lauder said that any “fair reading” of the White House statement would find that it “appropriately commemorates the suffering and the heroism that mark that dark chapter in modern history. “There are enough real antisemitism and true threats facing the Jewish people today. Our community gains nothing if we reach a point where manufactured outrages reduce public sensitivity to the real dangers we confront,” Lauder said. In a interview on NBC’s Meet the Press on Sunday, White House Chief of Staff Reince Priebus said that the Trump administration “obviously” recognizes and abhors what happened to the Jewish people during the Holocaust. But “I don’t regret the words” used in the statement, Priebus added. Tim Kaine, a Democratic senator from Virginia and former vice presidential running mate to Hillary Clinton, said it was “not a coincidence” that Trump’s aides dabbled in “Holocaust denial” on the same day that it issued a “religious test” at America’s borders. BERLIN, Germany — German right-wing populist party AfD decided Monday not to expel a leading member over a speech criticizing Berlin’s Holocaust memorial and urging the country to stop atoning for its Nazi past. 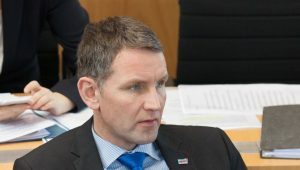 The AfD executive board held a three-hour telephone conference in which it voted 10-3 to instead impose “disciplinary measures” against Bjoern Hoecke, party chairman in the central state of Thuringia, sources told German media. Hoecke’s comments met with an instant uproar, with Social Democrat vice chief Ralf Stegner accusing him of making a “hate incitement speech” — which is illegal in Germany — that called for history to be rewritten. Germany’s Central Council of Jews also expressed outrage, saying Hoecke was trampling on the memory of six million Jewish Holocaust victims murdered by the Nazis. The AfD started out in 2013 as an anti-euro party, but has since morphed into an anti-immigration outfit railing against Chancellor Angela Merkel’s liberal refugee policy which brought some 890,000 refugees to Germany in 2015 alone. The party, which also disputes the place of Islam in Germany, is polling nationwide at around 12 to 15 percent ahead of a general election on September 24. A poll Sunday in the Bild am Sonntag newspaper showed that 61 percent of Germans believed Hoecke should be kicked out of the AfD for his speech. Aprominent member of the nationalist Alternative for Germany party wants to end the country’s decades-long tradition of acknowledging and atoning for its Nazi past. Bjoern Hoecke leads the party in the eastern state of Thuringia. He said Germany needs to perform a “180-degree turn” when it comes to remembering its past. Hoecke said Tuesday that the Berlin memorial to the millions of Jews killed in the Holocaust is a “monument of shame.” He told party supporters in the eastern city of Dresden that no other country would erect such a memorial in its capital and called instead for Germany to take a “positive” attitude toward its history. Nazi Germany was responsible for the murder of more than 6 million Jews and other minorities before and during World War II. Max Planck Institute urged to cancel talk by academic Norman Finkelstein. 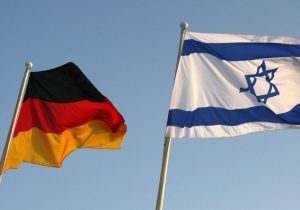 Israel’s embassy and leading deputies in the German parliament slammed a Max Planck Institute branch for stoking hatred of Israel and Jews with a series of lectures from a pro-Hezbollah US academic who trivialized the Holocaust and is popular among neo-Nazis. “It is outrageous that a distinguished German institution [Max Planck Institute branch in Halle] gives a stage to someone who spreads, in the best case, science fiction, and in the worst, pure incitement against Israel. Supporting [Norman] Finkelstein to maintain his academic facade is highly dangerous and an abuse of the scientific standards,” the Israeli Embassy in Berlin told The Jerusalem Post on Wednesday. Engelmeier cited Finkelstein’s support of the US and EU-classified terrorist organization Hezbollah. “In the past, Finkelstein compared the antisemitic terrorist organization Hezbollah with the resistance against the National Socialists. He compared Israel’s approach with that of the Nazis. He termed, in his most important work, the remembrance of Auschwitz as the ‘Holocaust Industry.’” Finkelstein’s remarks place him in the “center of right-wing radical deniers of the Holocaust and make him criminally liable in Germany,” Engelmeier said. Volker Beck, a Green Party deputy who is the chairman of the German-Israel Parliamentary Group in the Bundestag, told the Post that the Max Planck Institute’s invitation to Finkelstein has nothing to do with “qualified academic expertise.” Finkelstein leveled “false contentions against the Jewish Claims Conference… he explained his solidarity with Hezbollah and considers Hamas a ‘peace offensive’ against Israel,” Beck said. The group Alliance against Antisemitism and Anti-Zionism along with an anti-fascist student organization from the University of Halle protested on Monday against Finkelstein’s first talk. There were 30-50 protesters. Marie-Claire Foblets, the managing director of the department of law and anthropology at the Max Planck Institute, played a key role in organizing Finkelstein’s talks and has vigorously defended him. She told the Post it is absurd to call Finkelstein an antisemite. Post emails to Dr. Martin Stratmann, the president of the Max Planck Institute, were not immediately returned. The indifference to antisemitism at the Halle branch has raised eyebrows among monitors of modern antisemitism in Germany such as Dr. Efraim Zuroff from the Jerusalem office of the Simon Wiesenthal Center, because the Max Planck Institute played a role in advancing the Hitler movement’s lethal antisemitism. The Halle Jewish community called the lectures a “disgrace” and refused to meet with Finkelstein. Foblets advocated a meeting between Halle’s Jewish community and the anti-Israel activists. Engelmeier reminded the Max Planck Institute that many “artists, academics, social democrats, communists, journalist, and Sinti and Roma were victims of National Socialism. These Nazis’ murder of these victims was not disputed by Finkelstein, rather only the Jews, she said. “Finkelstein blames Israel alone for the terrorism in the Middle East. With this position, he illustrates his passion to deny facts and to deny the terrorist attacks of the antisemitic organization Hamas, and equates Israel’s defensive measures with the annihilation of the Nazis,” she said. World Youth Day was a large boost to attendance. But how about Pokémon Go? Let these kids play their game, then, not even in Auschwitz, but especially there. Let them feel again that mad methectic magic Huizinga spoke about. They can’t make sense of Auschwitz, anyway; they can’t fathom what led to such brutality, can’t make sense of such hate. But they can catch a Jigglypuff and feel a burst of life whistling through the airless chambers of the factory of death. And that’s no small thing, no minor testament to the same resilience the Nazis eagerly and futilely tried to extinguish. Where better than Auschwitz to admit we’ll never have real knowledge, and where better to declare we’ll always have great games? French Jews accused a left-wing presidential candidate of encouraging Holocaust denial following his comparison of the Nazi persecution of Jews to the situation of French Muslims today. 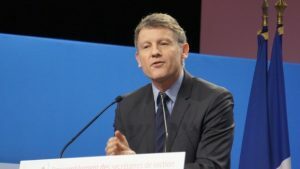 Vincent Peillon, who is running in the Socialist Party primaries ahead of the elections this year, made the analogy Tuesday during an interview aired by the France 2 television channel. Peillon wrote that he “clearly did not want to say that laicite was the origin of anti-Semitism of Vichy France,” which was the part of the country run by a pro-Nazi collaborationist government. He also wrote that “what the Jews experienced under Vichy should not be banalized in any way” and that he was committed to fighting racism and anti-Semitism. “I wanted to denounce the strategy of the far right, which always used the words of the French Republic or social issues to turn them against the population. It is doing so today with laicite against the Muslims,” Peillon wrote. CRIF “demands a clarification and immediate correction on the part of Vincent Peillon,” it said. Peillon, a lawmaker in the European Parliament, announced his candidacy in December to succeed President Francois Hollande as party leader and run as its candidate in April. He was appointed education minister in 2012 and served for two years. In the Socialist primaries, Peillon will face Prime Minister Manuel Valls, who has strong support in the Jewish community. Peillon’s mother, Françoise Blum, is Jewish. Peillon, who rarely talks about his Jewish roots publicly, signed a petition by the left-wing Jcall group, the European counterpart to J Street, supporting Palestinian statehood. In 2009, he celebrated the bar mitzvah of his son Elie at a Paris synagogue. He has another son, Isaac. Peillon is married to Nathalie Bensahel, a journalist who has written about France’s anti-Semitism problem. Peillon opposed the ban last summer on women wearing the burkini, the full-body swimsuit favored by some Muslims, on public beaches. Valls supported the ban, citing what he said was its use by radical Muslims to oppress women. Norway’s public broadcaster apologized for referencing Nazi death camps and the Jewish genocide in a satirical cartoon about the financial situation of university students. 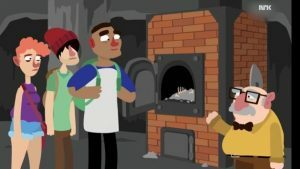 “This cartoon should not have spoofed the Nazi genocide, and we’re sorry this reference obstructed what the sketch is really about,” a spokesperson for the NRK broadcaster wrote on Facebook last week following complaints about the video, which on Thursday remained accessible on NRK’s online satirical section. It features three young characters who are taken by an older character on a tour of what appears to be a Nazi concentration camp similar to Auschwitz-Birkenau in southern Poland. When the group reaches an oven full of ashes and the remains of a human rib cage, one of the students enthusiastically inquires whether the oven is for making pizzas. The video, which opened the annual best-of compilation for 2016 of NRK’s Satiriks online satirical video platform, ends with the same students triumphantly holding up a rental contract while the other two students unload boxes at the concentration camp. Norway, where the Nazis installed the collaborator Vidkun Quisling as a puppet ruler, was home to 1,700 Jews before the Holocaust, according to Yad Vashem. Despite some protests by Christian faith leaders and the help of resistance fighters to Jews, a total of 763 Jews were deported from Norway by the Nazis and local police to death camps. Only 24 survived to return to Norway after the war.